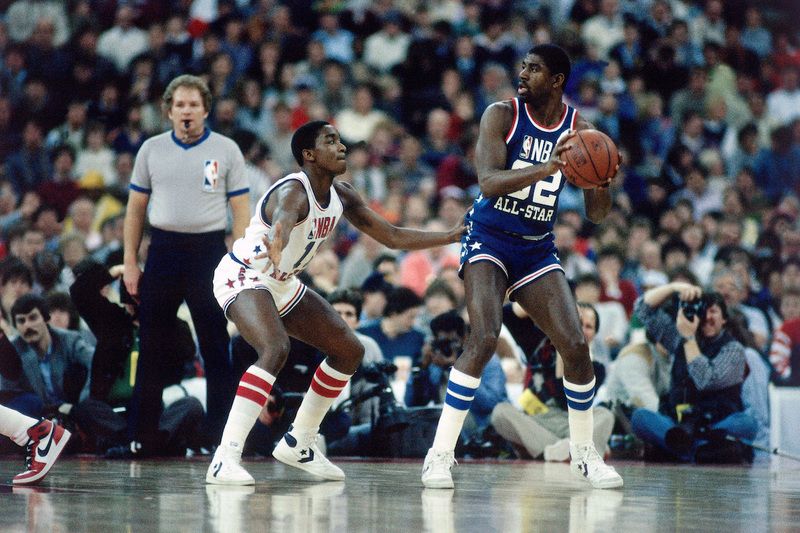 1985 All-Star game: Jordan Freezeout? It’s become one of the greatest legends of the NBA, the Freezeout. It was the 1985 All-Star game when rookie leading man Michael Jordan apparently was victimized in a far reaching plot to embarrass him, the effective inception of the famous Jordan reckonings and the inspiration for the bitter rivalry with Isiah Thomas and the Detroit Pistons that opened the curtain to reveal some of the greatest rivalry games and intrigues in league history. It’s been prominently told, handed down like a fireside story through the generations of how the conspiracy led by Thomas, Magic Johnson and George Gervin throttled and humiliated rookie star Jordan. And how Jordan then would predictably respond in his own special way in the first game after that All-Star break. Which happened to be in Chicago against the Pistons. Jordan had 49 points, 15 rebounds, five assists and four steals in that post-freezeout Bulls-Pistons game, a Bulls overtime win and the first of the many games that would raise the stakes of all future challenges and slights and kick off a brutal Bulls-Pistons basketball spectacle like few others. The NBA Wednesday announced that the All-Star game will return to Indianapolis in 2021 for the first time since that infamous game. Will Jordan throw out the first conspiracy? 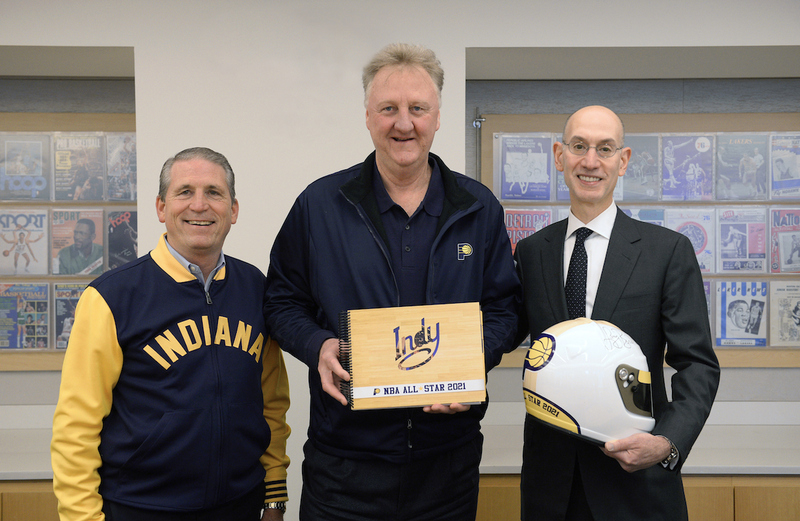 Rick Fuson, Larry Bird, and Adam Silver pose for a photo as the Pacers officially delivered its bid for the 2021 NBA All-Star Game. There’s been some question over the years if there really ever was a secret plan to embarrass the famous and fabulous rookie. After all, how many of these supposed conspiracies are real? It was too good a story for anyone to challenge too much. But George Andrews, a Chicago attorney who then was the agent for both Thomas and Johnson, says the tale really is more urban legend than reality, something akin to killer clowns, alligators in the sewers and spontaneous combustion. “You’re telling me Larry Bird was in a conspiracy with Isiah Thomas?” asked Andrews. “If Isiah said one thing, Bird would do the opposite (it would be two years later Thomas would, unfortunately at the conference finals, declare Bird only the MVP because he was white). Actually, that makes a lot of sense. So, sadly, it was a newspaper columnist who sort of got this all rolling, a good one, too, Charlie Vincent from the Detroit Free Press, who was close with the Michigan guys, Isiah and Magic, and on the way back to Detroit from the game. Andrews was the agent for Johnson who came up with the then shocking innovation to bypass NBA salary guidelines with a $25 million/25-year guaranteed contract for Johnson. It was the effective beginning of the million dollar contracts in sports, leading to Jordan’s renegotiation with the Bulls for his eight-year contract and then Magic’s being changed in the wake of Jordan’s. 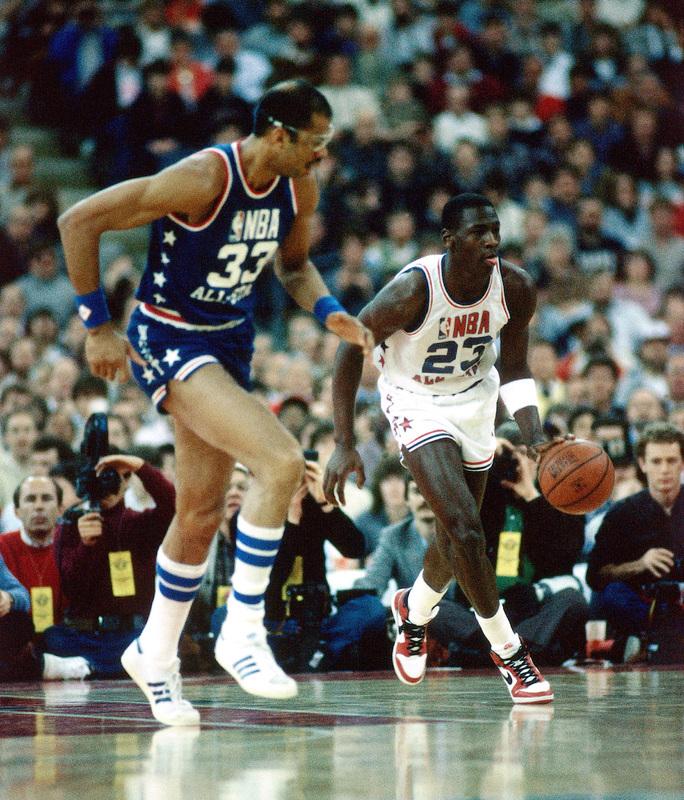 In that 1985 game in Indianapolis, Gervin did have 23 points attacking Jordan, so something was going on. Curiously, the next season the Bulls signed Gervin before the season and released Jordan’s best friend on the team, Rod Higgins. Jordan was furious about the move, a remnant as well from that All-Star game. But not yet willing to break from his North Carolina discipline of accepting organization first. 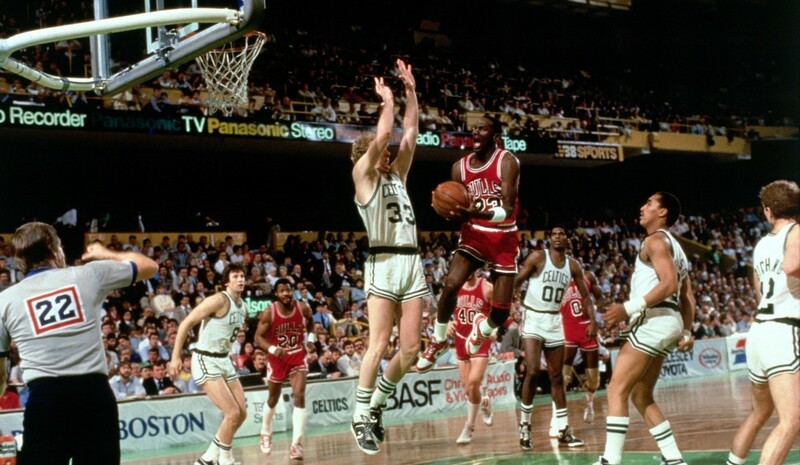 Jordan broke his foot three games into that 1985-86 season and would be replaced in the lineup by Gervin, who later fell into a drug problem in what would be his final NBA season. Jordan with his minutes restriction upon his return did begin to speak out. Another famous beginning. 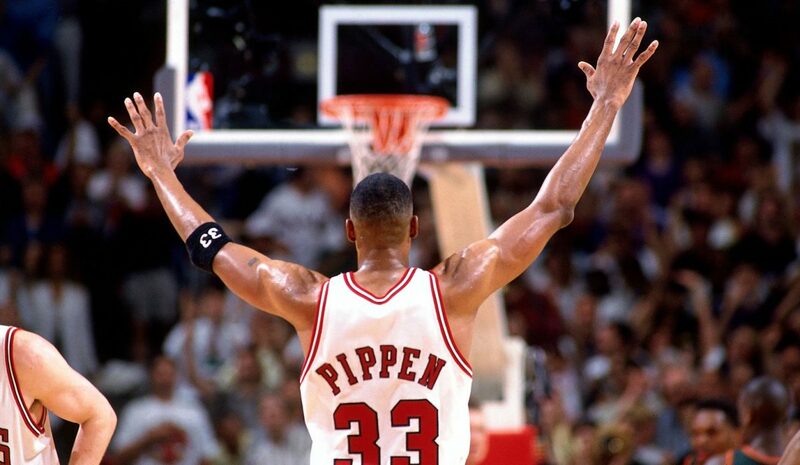 Jordan shot two of nine in the game and little was made of it afterwards by the media. He attempted more shots than East All-Stars Robert Parish, Dennis Johnson, Sidney Moncrief and Michael Ray Richardson and one fewer than Bernard King and Moses Malone from the East team. 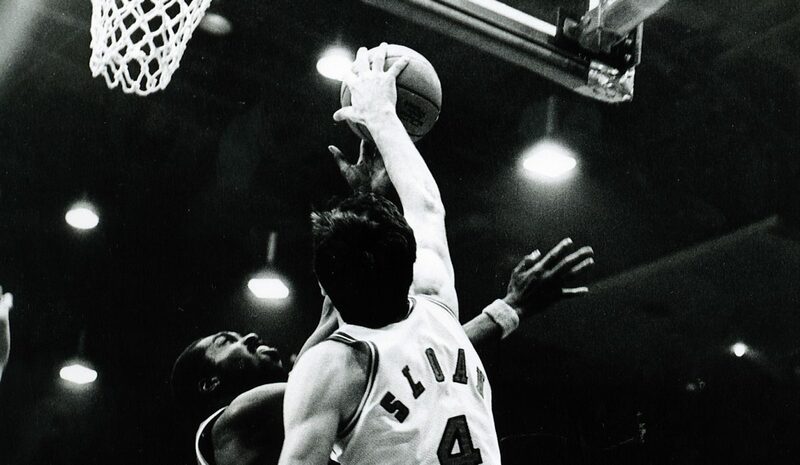 On the winning West team, Adrian Dantley, Alex English and Jack Sikma all had fewer shots. No. 1 overall pick Hakeem Olajuwon, whom the Bulls were desperate to draft ahead of Jordan the previous spring, attempted just two shots in the game. There was no story. And then there was. Hey, what’s the fun in that?